Some of our larger customers have asked for a simple process for managing changes to their decision trees. When there are multiple people involved in making edits, and the final versions need approval, the Zingtree Push Live tool makes this procedure a breeze. 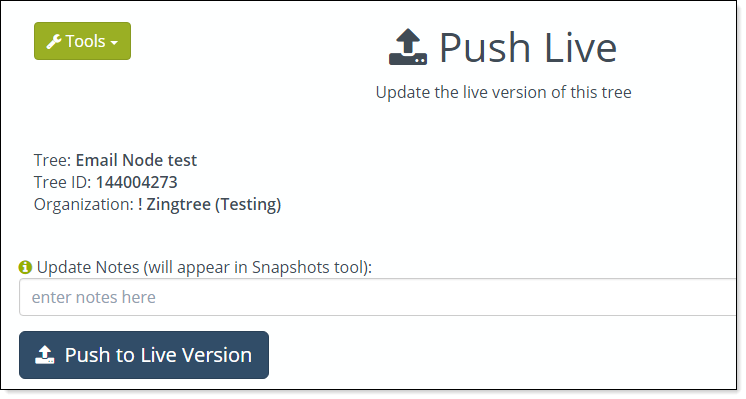 Push Live lets you have two versions of a tree – a development version and a live version. Your team makes changes to the development version, and when these changes are ready to go live, an administrator approves these changes by invoking the Push Live tool to update the live version of the tree. Using Push Live is optional, and can be implemented at any time. An author or authors make changes to a tree. Once the new tree is approved for release, an adminmistrator invokes a Push Live so that the new tree is available to end-users and agents. All changes and push events are tracked through the Snapshots tool. Select your tree from My Trees. Go to the Settings tool, click the Push Live tab, and check Enable Push Live. Make sure to click Update All Settings next. You can switch between the development and live version of your tree from the main Tree Tools screen. Go to My Trees, and select a tree, or use the All Tools option in the Tools drop-down on every page. The live version of a tree has different links than the development version. Make sure you are using the Publishing Links code for the live version of your tree by switching to the live version before using the Publishing Links tool. The tree ID for the live version of a tree is the same as the development version, except that it adds 000 to the end of the ID. For example: If your tree ID is 123456789, the ID of the live version is 123456789000. So you’ll need to use different publishing links when making the live version of your tree available to others. In order to update the live tree, you need to have Administrator rights on that tree. Once you’re ready to “go live”, invoke the Push Live tool from the main Tools page, or the Tools drop-down. You’ll be asked for update notes on this version, which makes it easy to track what changed. You can see the history of changes (with the update notes) for each update of the live version using the Snapshots tool (under More Tools). If you have several trees under the Push Live process, and you are using tree nodes to link them together, Zingtree will ensure the proper development or live version is linked. When editing in the development version, use tree nodes that reference the development versions for your other trees. When you push live, those tree nodes will go the live versions of the other trees if they exist. Tree nodes in the development version go to development versions of other trees. When you push live, tree nodes in the live version go to live versions of those trees. If a live version of a tree node doesn’t yet exist, the development version is used instead. Is this Push Live feature useful to you? Do you have any suggestions to make this process work even better for you? Let us know! This article was originally published on January 16, 2018. PreviousHow Do You Fix a Broken Process?